The hubby and I were privileged to attend the Philippine Campus Crusade for Christ’s 50 Years Celebration press conference last week. Although the traffic was pretty bad considering it was a weekend, we were still able to make it and was able to chat with few of the PCCC members. The PCCC vision and mission continues on as it changes lives and leads generations upon generations to Christ. For this, we give God all the glory! This year marks the 50th year of Campus Crusade for Christ (CCC) in the Philippines, a Christian ministry that focuses on introducing Jesus to students. Campus Crusade for Christ believes that today’s college students are tomorrow’s world leaders. Imagine the changes the world would see if every one of the 110 million college students all over the world had an opportunity to hear and respond to the gospel every year. Our mission is to see students everywhere embrace the purpose, love and forgiveness that God offers them in a relationship with Jesus Christ. Throughout the years, thousands of young lives have been touched by Campus Crusade’s ministry in the Philippines. Many are now leaders in their respective fields. We would like to revisit some of them as we give glory and honor back to God. 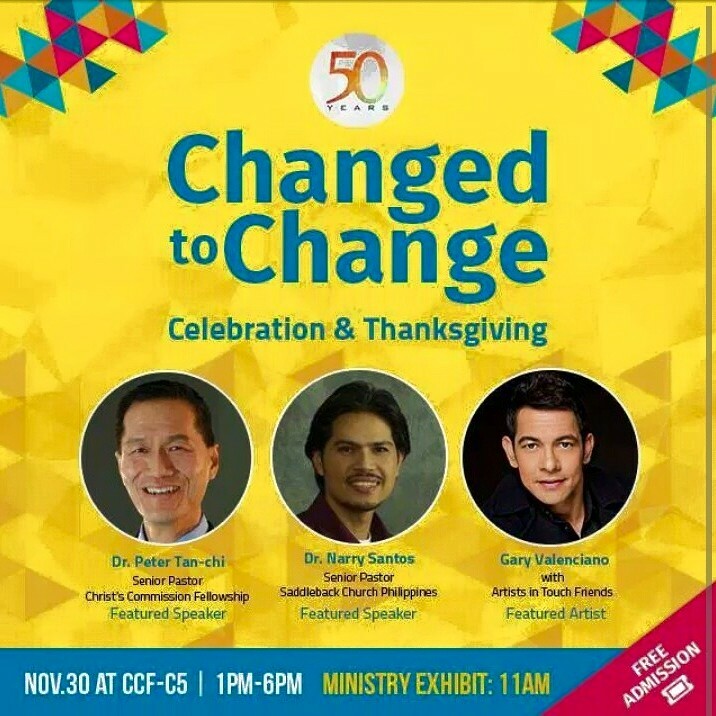 Philippine Campus Crusade for Christ Celebrate 50 Years #ChangedToChange Culminating Event is happening on November 30, 2015 at CCF-Pasig, from 1-6PM. Free admission.